Do these contestants watch the show before their turn? My favorite channel is Food Network, and my favorite show is Chopped. The opportunity to watch my two favorite things: food and drama. It is a little unnecessary drama, but such is life. They play up the count down of the clock and cut to commercial before anyone is actually chopped off the block. My mom can't watch the show. She feels bad for the losers and thinks the judges could be kinder. She also thinks I can do no wrong and taught me that everyone is a winner. #MaybeMaybeNot. The thing that gets me with each episode is the lack of preparation. These are chefs who say they want to win $10,000, but they don't seem to research the biggest difficulties of the show. Don't watch the show? No worries, I won't berate you now. Instead, I'll show you how success in the show is similar to success in parenting. 5. Research how to deal with the weird stuff. There has been brown bread in a can, 100-year-old egg, marmite yeast extract, sea cucumber, and lots of gummy candies. Often in a Chopped episode, something will surprise the contestants. How do I cut this? What pairs well with goats brains? Come on people! Many websites and Reddit lists are dedicated to the weird ingredients on this show. Take a little time and google it. Unless you're one of those people who likes to be unprepared and made a fool on television. Google is your friend! 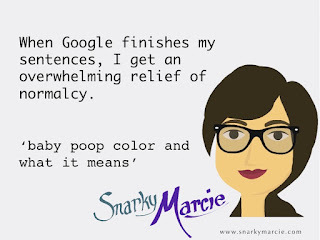 So, you're home with a newborn and wondering if that bowel movement was normal? Look it up! There are several sites that show charts, descriptions, pictures. Sure, you'll want to vomit and may progress on the road to desensitized, but you'll sleep easy knowing your kid is healthy. Just kidding, you won't sleep either way. #IsItSupposedToBeGreen? 4. Stick with what you know. Know your textures and your flavors. If it doesn't add a flavor dimension, don't add it. You don't want a dish that is all mush, but useless crunch is always criticized. The celery didn't add anything. The peanuts overpowered the dish. If you'd like that $10,000 prize, spend a little time looking up flavor profiles and how they impact each other. You may slack off at work from time to time, but if it was a day you could get paid 10 grand wouldn't you try? #ChaChing. Your 4-year-old is questioning God and religion. Please, do not start philosophizing things you don't really know about. As a Christ-follower, I look forward to having talks about Jesus with my little girl and for myself I also keep up-to-date on other types of religions. That isn't the case with everyone, and you need to be honest if that's true for you. Please, please, please, I cannot ask enough, do not guess at religion with your child. If they are interested, nurture it like you would any other interest. If your little one wanted to play basketball, you would sign them up for leagues, camps, lessons. You'd drive them to games and cheer them on, even if you've never cared for the sport. I love seeing parents willing to make that effort with religion, taking their children to church, VBS, Sunday School, and letting them make their own choices. Your children need support and protection. Don't drive them down to cult headquarters and setup their own sweat lodge, stick to textbooks for that one. #Scary. 3. Keep track of the important stuff. You've never made ice cream? It must be simple, right? You should totally waste 15 minutes trying to work the machine while you ignore the basket of ingredients you're required to use. Solid plan. It doesn't happen every episode, but many have involved a contestant forgetting to use or plate a basket ingredient. Well congratulations, you're a failure in more than one way. #EpicFail. Don't lose your kid, that's number one! Get off your phone and actually supervise. Don't helicopter, but keep peripherals on them and be ready to encourage or discourage behavior. Your child needs that feedback. Kids cost money. They break things; they stain things; they all around destroy things. Again, keep them safe, but let them explore. #ExploringIsLearning. 2. Spend some time on plating. Judges eat first with their eyes. I know it's lame. It's all going to the same place, right? But in the real chef gig, plating matters. You wouldn't feel confident at a restaurant where all your food came out splattered together. This one is pretty literal. Help them get well-balanced meals. That is your responsibility, one of many. She may be adorable asking for that third cookie and refusing her protein, but you have to be the bad guy sometimes. Guess what. She will still love you, rely on you, and go to you with her scraped knees. They like to play up the drama on the show, so I really hope not everyone is down to the wire like it appears. There are, however, often times where items are undercooked or poorly layered. I really believe that the clock is where the winner lives. The person who actually paces themselves is successful. You will get emotional that they grow up so fast. You will also pray for them to hurry up and get over stages in their life. Try to appreciate all of these moments. And, prepare for your time to become their time. You want to stay out all night, keep them up and let them sleep in tomorrow. Don't do it! Trust me, it's not worth it, especially with a little one. They need their schedule and they need their sleep. Be kind and make the sacrifice. They grow up fast and you'll be past the stage before you know it. Fear of missing out (FOMO)? Subscribe now! Have an idea for a new post? Dear Snarky – WTH on a College Reveal Party? Three ways to tame road rage (or not). How to strengthen an argument. How to be a normal parent. How to cook brown rice. It's Friday, you made it! Get Snarky Marcie delivered straight to your inbox. Enter your email address. Be sure to look out for an email asking you to verify.